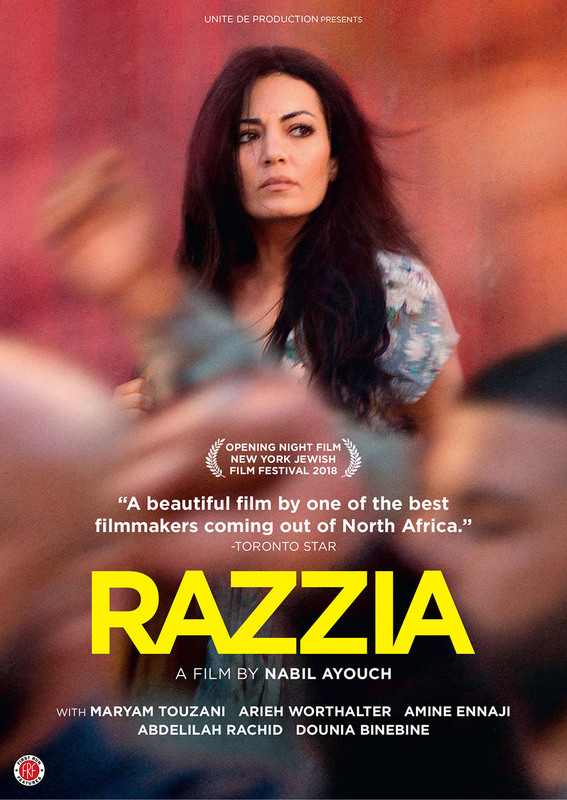 From French-born (Moroccan heritage) writer, director Nabil Ayouch (Much Loved, and Whatever Lola Wants), comes the powerful drama, Razzia, co-written by Maryam Touzani who also stars in the indie, foreign language film. Upheaval in the streets of Casablanca serves as the canvas on which multiple storylines of this film collide. Beautifully framed, poetically and authentically Razzia can serve as a serious and worthy conversation piece, as a window to the old-world conflicts that look like chaos in the eyes of us living in the west. Salima (played by actress Maryam Touzani) is a free-spirited, modern woman who cannot see a reason to submit to the traditional views of men, causing further frictions in her own relationship, while Hakim (actor Abdelilah Rachid) an aspiring singer and musician is struggling to find his place in a society that shuns artistic expressions, especially ones with western influences. Teenager, Inès (actress Dounia Binebine) lives a privileged, comfortable life on the surface with growing pains and inner struggles, in a society that expects certain types of behavior from a young woman who would grow up to live in the same society as the one Salima navigates as an adult, a society that piles on to a list of expectations with age. The other characters whose storylines develop in a longer span in time are Ilyas (actor Abdellah Didane) a humble, blue-collar man with an undying fascination for Casablanca, the 1942 classic film. Working for a restaurant owner Joe (actor, Arieh Worthalter) who seems to be one of the few Jewish residents of Casablanca, facing his own struggles, some brought on by the ripple effects of the Arab Spring. Ilyas’ aging mother YTO (Saadia Ladib) shares the city with the rest of them as a woman who still believes that love is out there and one, if needed, must chase it. A young Berber teacher (actor, Amine Ennaji) leaves his childhood village behind to search for acceptance, if not answers, in the world outside of what he has known. In “Razzia,’ Salima (played by actress Maryam Touzani) is a free spirited, individual not bound to old-world views about what it means to be a woman. Distributed by First Run Features. Available on DVD. In its observation and a look inside the human spirit, Razzia is a tender, emotionally charged drama that will stay with the viewer long after the picture fades to black. Some Middle Eastern viewers, such as Iranians might notice echoes of the 1978-79 Iranian Islamic Revolution during which millions of Iranians rose to their feet to oppose the Shah (the monarch king) demanding a government and social codes of conduct based on Islamic teachings and values. The film questions the position of religion, wealth, personal freedom, and dreams in a society that does not seem to have healthy levels of them, and the burden and bravery it takes to break free. Teaching the tradition! in “Razzia,” actor Amine Ennaji (as Abdallah) struggles to balance science with the Islamic way of teaching it. In Razzia, filmmaker Nabil Ayouch constructs a moving, powerful story of everyday humans with very human needs. At odds with the changes taking place and signaling the new normal, there are brewing, visible tensions in all of the characters in Razzia. Their process of coping, moving, and the change is something that Director Ayouch threads delicately, honestly, and unapologetically, which makes these men and women relatable, and lifelike – believable. It is perhaps the biggest strength of the film; the connection it will make with wide, international audiences. We connect because we know, and for the most part, understand the struggle of its characters. Below, watch the trailer for the film.